There was a sea of red dresses backstage at the Hammerstein Ballroom when women from all facets of the entertainment industry came together for a good cause. 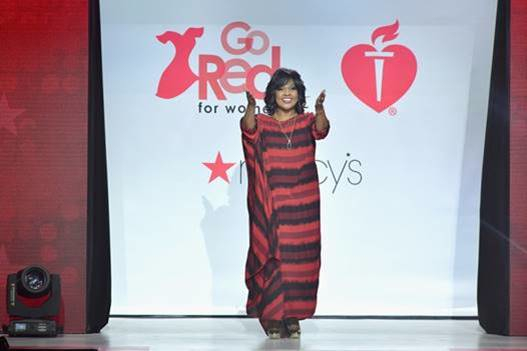 Each woman had her special reason for walking the ramp, but one thing for sure the audience could feel the love and support at this year’s 2018 American Heart Association’s (AHA) Go Red For Women™ Red Dress Collection, presented by Macy’s. “I Go Red in memory of my brother, Ronald Winans, who passed away from heart disease at the age of 48 in 2005,” says Winans. This year’s show was hosted by Marisa Tomei (My Cousin Vinny/The Handmaid’s Tale). The following 17 celebrities walked in the show: Adrienne Houghton (The Real), CeCe Winans (Grammy award-winning gospel singer), Elisabeth Röhm (Law and Order), Ginger Zee (Chief Meteorologist, ABC News), Grace Helbig (television and YouTube personality), Kate Walsh (Grey’s Anatomy and Private Practice), Kathy Ireland (model and actress), Lea Salonga (Broadway actress and voice of two Disney princesses), Liz Hernandez (Access Hollywood and E! News), Lynn Whitfield (Greenleaf), Marion Ross (Happy Days), Maye Musk (model, dietitian, and latest CoverGirl), Melissa Joan Hart (Sabrina the Teenage Witch), Niki Taylor (supermodel), Rachel Lindsay (The Bachelorette), Tatyana Ali (Fresh Prince of Bel-Air) and Zuri Hall (E! News). Lea Salonga kicked off the show with a musical performance, En Vogue wrapped up the show with a musical number and Harley Viera-Newton (DJ, model and fashion influencer) was the DJ for the night. Joining the celebrity line-up this year were two heart disease survivors – Macy’s employee Karen A. Hill from Washington D.C., who is living with cardiomyopathy, as well as an AHA national spokeswoman and Go Red For Women “Real Women” Lilly Rocha from Pasadena, CA, who survived a heart attack at the age of 37. This entry was posted in Gospel, Pictures, Reviews, World News and tagged 2018 American Heart Association's (AHA), CeCe Winans, Go Red, Hammerstein Ballroom by Kris Patrick. Bookmark the permalink.